Ramu Agri Investments Ltd (RAIL) is carrying out massive multi-million kina expansion of palm oil in Ramu Valley of Madang province and adjoining Markham Valley of Morobe province after having its product rated as among the best in the world. These projects include the biggest-ever 440km-long irrigation project in PNG using water from the Gusap River, building of satellite towns or “village estates” at Surinam and Dumpu past Gusap in the Usino-Bundi area, a second mill at Dumpu, and getting more out growers from Ramu and Markham valleys. 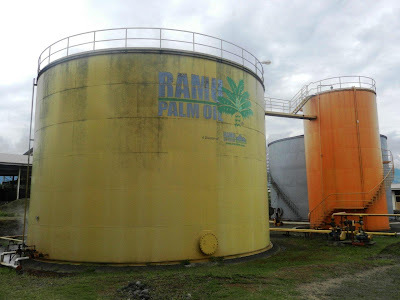 RAIL general manager Jamie Graham told The National in an exclusive interview in Gusap on Saturday that all these were part of the company’s plan for palm oil expansion after Ramu Sugar was taken over by the giant New Britain Palm Oil Ltd (NBPOL) in 2008. ﻿ He did not disclose any figures, however, said these ran into the “millions”. He said palm oil in 2008 covered an area of 4,500ha and this had increased to 11,000ha since then – largely state leases at Gusap, Surinam and Dumpu – with the company looking at acquiring customary land for expansion. “Our plan over the next five years is to go up to 17,000ha,” Graham said. He said the irrigation project was necessitated by low rainfall and soil fertility and would be carried out over 620ha to see if it was viable. “It’s a unique project in many ways,” Graham said. He said at Surinam and Dumpu, apart from quality housing being built for staff, trade stores, community centres and sporting facilities would also be built. “We would hope to start by the end of 2013. The current mill at Gusap, which has been in operation since March 2008, was the first to be established in the Momase region with a capacity of 30 tonnes of fresh fruit bunches (FFB) per hours. Ramu palm oil is Roundtable of Sustainable Palm Oil (RSPO)-certified, since 2010, meaning it is internationally-recognised. “We have a bulking terminal in Lae. “It is then shipped and exported straight to Europe.